Chicago tried too with the Sears Building (now officially called the Willis Building, the London-based insurance business securing naming rights) a year after the opening of the doomed Wall Street landmark. It was followed by Kuala Lumpur and the Petronas Towers (1998) and the Tokyo Skytree (2011). As of the time of this writing the tallest structure in the world is the Burj Khalifa, a structure of outstanding design. 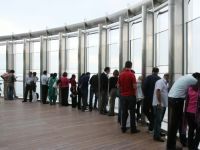 When it first opened the observation deck at 1483ft was the highest outdoor viewing platform in the world, but it has since been surpassed by the Canton Tower in Guangzhou at 1601ft and Skytree. Records are made to be broken and now Saudi Arabia has embarked on the Kingdom Tower in Jeddah which will stretch to a height of 3280ft, or one kilometre. Completion has been targeted for 2018. The architect is Chicago-based Adrian Smith, which brings us back to the remarkable Burj Khalifa, which he also designed. Construction work began in 2004 and by 2007 the viewing platform level had been reached It was topped out in January 2009 and officially opened in January 2010. The first 16 floors of the building have been taken by the 5-star Armani Hotel, named after the Italian fashion designer, and a project in which he took a personal interest. The hotel also offers some magnificent suites on levels 38 and 39. The building also includes 900 apartments and 37 floors of office space. Entrance to the Burj Khalifa observation deck called ‘At the Top’ is via the lower ground floor Dubai Mall and it is best to book in advance. The visit price is currently £32.50 but if you want the instant Fast Track it is £50. For a family of four a trip to the platform and fast food in the Mall can cost £250. And then there are the shops to visit. Once booked you receive a timed ticket but do be prepared to linger at the initial security, the first lift, and then the (main) second elevator. The waiting is well organised but the Burj Khalifa is very popular. Patience is required, the kids screaming in many languages. Allow 1½ hours for the visit. In less than a minute, the elevator reaches the observation deck. The yacht harbour looks like a toy. High windows circle the entire viewing platform and you scan the horizon and the distant streets below through computerised viewfinders, which also have pre-programmed day and night-time vistas of the city and surrounding region. Visitors can also buy official merchandise from the At the Top retail shop. The excitement of course is the view and the extraordinary lift ride but you need to keep your eyes open for several interactive features available that chart the evolution of the modern Dubai and show how the Burj Khalifa dramatically alters the city skyline. You have to admit that the viewing platform is not so high at Bermondsey. The shopping area one looks down upon is far less sophisticated, but the recently redeveloped Borough Market has a great atmosphere. On paper the Dubai viewing platform at 1483ft is much higher than The Shard, but in a practical sense you are again very high up, with tremendous views, and it makes little difference. 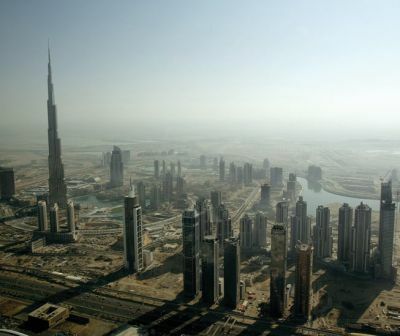 What you view from Burj Khalifa is the massive development that is Dubai, and a lot of desert. With The Shard you see history, The Tower of London and Tower Bridge, Westminster, both Heathrow and London City Airport and Wembley Stadium. “You pay your money and make your choice”.